In last year’s 2016 report, I opened with comments about the troubling times, political, cultural and economic, we lived in and then expounded on the industrial laser industry seeming to defy bad news with its own good economic news. Well, I could have copied that report, changed a few numbers, and saved a lot of time and effort in compiling this year’s. I won’t, however, because there are some changes, both good and bad. Despite this, most countries’ economies improved in 2017 and the average GNP slightly increased. As a result, manufacturing, the backbone of these economies, improved. In response, the industrial laser market experienced another growth year led by exuberant fiber and excimer laser revenues. Overall total market revenues tallied a whopping 26% increase, a level not seen since the early days of this almost-50-year-old industry sector. I’m going to pause to explain how the market numbers are generated. Industrial Laser Solutions partner, Strategies Unlimited, compiles and prepares annual revenue data for us, primarily from public companies representing several of the largest industrial laser manufacturers, including IPG Photonics, Coherent, Inc., along with data from the largest company, privately held TRUMPF. Because of the timing of these reports, revenues for the final quarter of the calendar year are taken from the guidance offered in their reports. Consequently, adjustments made in prior year revenues may be made if fourth-quarter results published early in the next year are outside the limits of the guidance advisories. This happened last year in the case of industry leaders IPG Photonics and Coherent, Inc. Okay, let’s look at the numbers. After some adjustments in revenues, 2016 turned out to be a good year for industrial laser sales led by outstanding fiber laser growth and the beginning of deliveries of high-power excimer lasers for applications in manufacturing mobile phone displays. This trend continued in 2017 with two companies, IPG Photonics and Coherent, Inc., racking up outstanding first-half revenue growth. Processing of Micromaterials gained 24%, most of it from a 56% increase in revenues from the face plate processing application. High-power processing of Macro materials shot up by 34% as sheet-metal-cutting growth of 30% was led by the market in China. 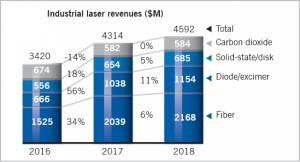 Most significantly, fiber laser revenues, up 34%, represented 47% of total laser revenues, further eroding CO2 lasers’ market share to 13% of the total as CO2 revenues in 2017 declined by 14%. Solid-state lasers, which in prior years had reducing market shares, experienced a rebirth as high-power disk laser revenues propelled a strong 26% increase, thanks to sales into the metal-cutting and welding markets. Making a notable contribution to overall laser revenue growth was the burgeoning markets for high-power diode and excimer lasers in the Other category. Marking (including engraving) represents about 15% of all industrial laser revenues. An increase of 7% in fiber laser revenue continues to eat away solid-state lasers’ share as an unrelenting reduction in unit selling prices drove market growth, specifically in China. CO2 lasers for engraving applications remained a positive area of growth for that laser. In the Micro Materials sector, high-value excimer laser sales for mobile phone and hand-held display applications showed a 56% growth as system deliveries peaked in 2017. Lasers with output power <500W found a growing market in Additive Manufacturing (a 30% gain) and Non-Metal Processing (up 9%), and Fine Metal Processing (fine blanking) showed two long-term growth opportunities. Among the Macro (=> 1 kW) applications, Welding/Brazing tallied the strongest growth at 50% as fiber for welding and high-power diodes for brazing increased industry acceptance. Increasing demand for sheet-metal-cutting laser systems, primarily in China and other Asian countries, boosted growth from a modest single-digit growth pattern to a recent-year high of 29%. And a fast-growing market for production-rated Additive Manufacturing systems caused a spurt in high-power fiber, diode and CO2 lasers. Looking ahead to 2018, global companies in manufacturing project a repeat of 2017, all things being equal. Under these circumstances, industrial laser manufacturers are also bullish about market strength in the coming year, expecting a slightly diminished first-half growth, compared to 2017’s ebullient experience. Expect revenue growth in 2018 to return to a modest, but industry-acceptable, single-digit level of 7%. Two factors drive our expectations: the 2017 spike in laser cutting in Asia will cool down and return to a more-normal 5% growth pattern, and second-half delivery schedules for high-priced excimer laser annealing systems for display production will start to wind down. We expect Marking, Micro and Macro laser revenues will experience single-digit growth, which has consistently been the trend in these markets. Lest readers see this as an overly cautious forecast, remember a simple marketing maxim — before you can have growth, you must match prior years’ sales. 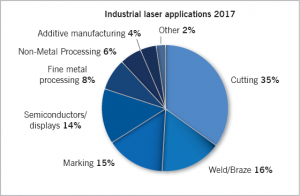 For industrial lasers, the target is the superheated $4.3 billion market of 2017. One cautionary note — the recession of 2008/9 will be 102 months old in January, and wise economists cite this as a strong aberration according to CNBC. So a word of caution, typical economic cycles are 58 months, so it wouldn’t be remiss to Google recession forecasts periodically. Those who were surprised by the start of the Great Recession of 2008/9 can speak to this suggestion. David Belforte is Editor-in-Chief of Industrial Laser Solutions.